Pictured: Senator Michael Moore with Governor Charlie Baker, Major General Gary Keefe and legislative colleagues in the Governor’s Office at the State House in Boston. BOSTON – Senator Michael O. Moore (D-Millbury) joined Governor Charlie Baker, Lt. 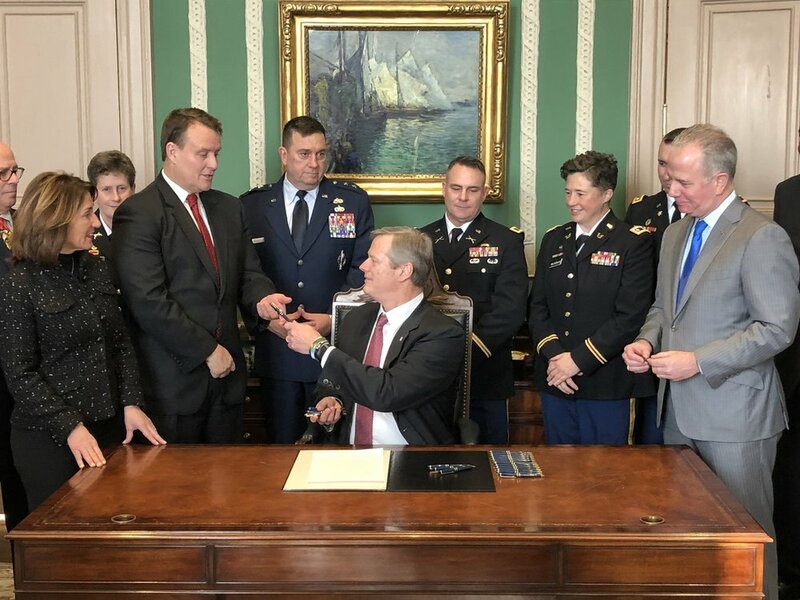 Governor Karyn Polito, Massachusetts National Guard Major General Gary Keefe and legislative colleagues for the ceremonial signing of legislation to update existing laws relative to the National Guard. The newly-signed law modernizes and streamlines parts of the National Guard’s enabling statute. Among its provisions, the law establishes a Uniform Code of Military Justice consistent with the American Bar Association’s Model State Code of Military Justice already adopted by most other states. The law also increases the minimum daily pay for soldiers and airmen performing state active duty. In particular, the law increases the minimum daily pay for soldiers and airmen performing state active duty from $100 per day to $200 per day. This increase now makes the statewide minimum pay in Massachusetts the highest in the nation. To view the text of the law, codified as Chapter 369 of the Acts of 2018, please visit the Legislature’s website by clicking below. Pictured: Senator Michael Moore speaking with Governor Charlie Baker, Lt. Governor Karyn Polito, Major General Gary Keefe and legislative colleagues in the Governor’s Office at the State House in Boston. Pictured: Senator Michael Moore receives a pen at the bill signing ceremony from Governor Charlie Baker surrounded by Lt. Governor Karyn Polito, Major General Gary Keefe and legislative colleagues in the Governor’s Office at the State House in Boston.